Advantech, a leading industrial computer designer and manufacturer, and ID TECH, a designer and manufacturer of payment devices and components, recently announced the launch of the AIM-35 industrial tablet with integrated payments. AIM-35 tablets are designed for the demanding needs of retail and hospitality businesses. Advantech and ID TECH have aligned to incorporate ID TECH’s VP3300 payment solution with the Advantech AIM-35 rugged tablet to provide an integrated mobile tablet payment system needed to operate efficiently and effectively to speed order entry and simplify workflows for retail and hospitality staff and customers. The AIM-35 together with VP300 configuration supports three leading cashless payment formats: MagStripe, smart card and contactless. Supported NFC/contactless vendors include: Android Pay, Apple Pay, Samsung Pay, MasterCard PayPass, Visa VCPS, American Express ExpressPay, Discover DPAS, Interac, Felica, and more. 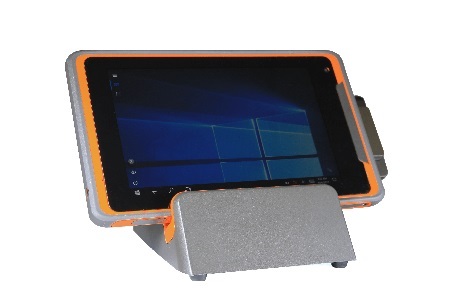 “ID TECH payment modules provide the perfect combination of modern features and interoperability for our mobile POS tablet, which helps us deliver a seamless off-the-shelf solution,” says Jason Zhang, product manager at Advantech. Advantech’s AIM-35 industrial-grade handheld tablet mobile POS system is now shipping from Milpitas, California. The tablet enables multiple applications with an ultra-low power consuming Intel® Atom™ processor and multi-OS support. To further meet retail and hospitality industry needs, AIM-35 provides 8 hours operation and IP65-rated water and dust protection in a robust 4’ drop-tested tablet. Offering a variety of expansion modules such as MSR, RFID, IC card reader and 2D barcode scanner, the AIM-35 satisfies various retail uses as well as inventory management or self-service operations. Hold the AIM-35 in your hands at the upcoming TRANSACT show (ID TECH Booth #1019) this April 17-19, 2018. Founded in 1983, Advantech is a global leader in designing and manufacturing trusted innovative embedded and automation products and solutions. Advantech offers comprehensive system integration, hardware, software, customer-centric design services, and global logistics support to develop high-quality, high-performance computing platforms. We cooperate closely with our partners to provide complete solutions for a wide array of applications across a diverse range of industries including retail and hospitality to realize our corporate vision of Enabling an Intelligent Planet. For more information, vist www.advantech.com. ID TECH develops and manufactures a full range of payment peripherals, including magnetic-stripe card readers, Smart Card (ICC) readers, Contactless Card (NFC, RFID) readers, Bar Code readers, Point of Sale keyboards and displays, Secure PIN Entry products, mobile payment devices, and custom electronic components (including ASICs). The company supports customers with a wide array of off-the-shelf products as well as highly customized solutions for retail Point of Sale, Banking, Hospitality, Access Control, Transportation, Gaming, and Kiosk industries, among others. Founded in 1985, ID TECH now employs more than 200 people in locations worldwide.